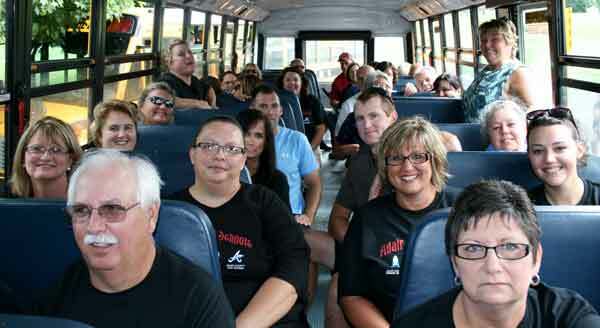 Almost every single Adair County School District employee boarded a school bus Wednesday morning to kick off the 2016-2017 school year with a “Think like a Kid” tour. The purpose of the exercise, according to Supt. Alan Reed, who spoke to faculty and staff before departing from Adair County High School, was for teachers, administrators, bus drivers, and other employees to understand the rigors that some students go through just to make it to school each day. The two-hour tour, which included approximately 40 employees per bus, allowed teachers and staff to see the perilous routes that some bus drivers must navigate daily, from narrow roads running beside steep bluffs to winding hill climbs and descents. Federal Programs Director Steve Turner, who served as one of the buses de facto tour guides, explained that these roads are the ones Reed and Transportation Director David Jones investigate to determine if school should be canceled for snow. Another aspect of the tour served as a reminder to teachers the conditions in which some students live. Turner explained that Adair County’s poverty rate, which hovers near 70-percent, includes many students in the district, and some poorer areas were noted for having a lot of children living in the area, though no homes were pointed out specifically, to protect families’ privacy. The event concluded with a meal for all employees at A Barn Affair at Turkey Trot Farms. Cutline: School employees on the No. 41 bus for Wednesday’s “Think like a Kid” tour to kick off the new school year.